Disclaimer: I received a complimentary copy of this book from Blue Rider Press via NetGalley in exchange for an honest review. Ernesto the bear from space and his friends the Kevin the duck and a cat (at least I think it's a cat) grapple with confusing topics such as internet dating, abstract art and whether or not "everything happens for a reason". Meanwhile, a dog traps smaller animals and introduces them to drugs and Tomas the starfish is disgustingly cool. Poorly Drawn Lines, based on the popular web comic by Reza Farazmand, is an odd mixture of whimsy and misanthropy. It's a little dark at times, but that's what makes it funny. The art is similar in style to Dilbert by Scott Adams and the humour reminds me a little of Pearls before Swine and also of Andrew Weldon, cartoonist for The Big Issue and The Sydney Morning Herald. As well as the comics the book contains short essays and pieces of short fiction about random topics including the weather, a woman who worked in a laundromat and birds wearing pants. 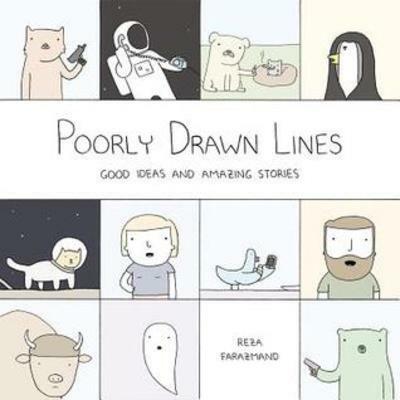 Poorly Drawn Lines is a fun quick read that would be great to bring out during coffee breaks or on public transport. It will appeal to fans of the comic and people with a bit of a quirky sense of humour.